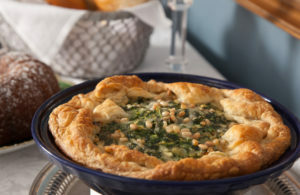 Distinctive Inns of New England offer healthy spinach breakfast pie recipes. 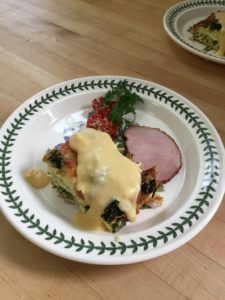 As we kick off the summer season and watch the seedling spinach plants start growing into salad-sized, we thought it might be helpful to share some of our best breakfast pie recipes featuring this healthy ingredient. 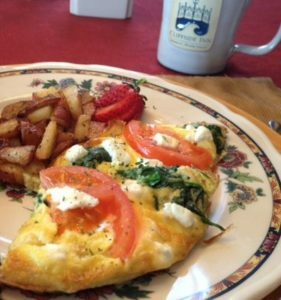 After all, every romantic getaway at every one of the 12 Distinctive Inns of New England (DINE) starts with a fabulous breakfast featuring healthy and hearty homemade breakfast entrees and sides. Hey! There’s a good reason the acronym for our special collection of New England inns is DINE. And speaking of romantic getaways and kicking off the summer season, have you seen our special Kick off to Summer offers from Distinctive Inns of New England? Click here to access the first-ever spring season promotion from DINE. 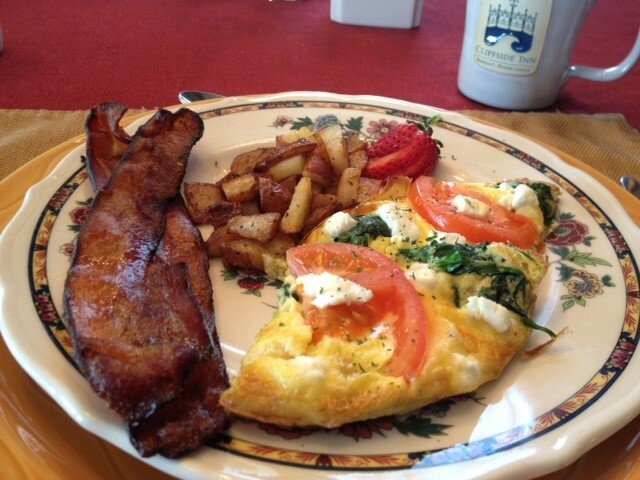 Today, we feature a few breakfast recipes with spinach front and center in the ingredients. Thaw puff pastry sheet. Once its thawed, butter pie dish and then place down pastry sheet. Press it around dish for crust. Sauté Chopped Onion in butter over medium heat until translucent. Beat 6 eggs in a separate bowl. Bake at 350° F for 35-40 minutes. SUPER delish and very healthy! Adjust oven rack to middle position and heat oven to 225 degrees. Arrange bread in single layer on large baking sheet and bake until dry and crisp, about 40 minutes, turning slices over halfway through drying time. (Alternatively, leave slices out overnight to dry.). When cooled, butter slices on one side with 4 tablespoons butter; set aside. Heat 4 tablespoons butter in medium nonstick skillet over medium heat. Sauté shallots until fragrant and translucent, about 3 minutes; add spinach and salt and pepper to taste and cook, stirring occasionally, until spinach and shallots are combined, about 2 minutes. Transfer to medium bowl; set aside. Add wine to skillet, increase heat to medium-high, and simmer until reduced to 1/2 cup, 2 to 3 minutes; set aside. Arrange half the buttered bread slices, buttered-side up, in single layer in dish. Sprinkle half of spinach mixture, then 1 1/4 cup grated cheese evenly over bread slices. Arrange remaining bread slices in single layer over cheese; sprinkle remaining spinach mixture and remainder of cheese evenly over bread. Whisk eggs in medium bowl until combined; whisk in reduced wine, half-and-half, salt, and pepper to taste. Pour egg mixture evenly over bread layers; cover surface flush with plastic wrap and refrigerate at least 1 hour or overnight. Remove dish from refrigerator and let stand at room temperature 20 minutes. Meanwhile, adjust oven rack to middle position and heat oven to 325 degrees. Uncover strata and bake until both edges and center are puffed, and edges have pulled away slightly from sides of dish, 55-60 minutes. Cool on wire rack 5 minutes; serve with cheddar cheese sauce. Melt butter and then add flour and salt and cook. Add Worcestershire sauce, milk, and cheddar cheese. Blend together until cheese is melted and sauce is smooth. Top individual pieces of the strata with the sauce. Beat egg and add salt and pepper to taste. Add to spinach and cook for about 2 minutes. 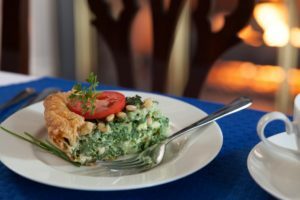 This entry was posted in advice, Captain Jefferds Inn, culinary travel, Dining, Distinctive Inns of New England, Harbor Light Inn, Recipe and tagged breakfast pies, breakfast pies from Distinctive Inns of New England, breakfast recipes from innkeepers, breakfast recipes from New England B&Bs, Captain Jefferds Inn breakfast recipe, Cliffside Inn breakfast recipe, Distinctive Inns of New England recipes, egg recipes, Harbor Light Inn breakfast recipe, healthy recipes, healthy recipes from New England innkeepers, innkeepers favorite spinach recipes, innkeepers offer spinach recipes, New England Inn recipes, spinach breakfast recipes, spinach breakfast recipes from Distinctive Inns, Spinach recipes by DINE Blogger. Bookmark the permalink.